This page represents links and information that is explicitly included in all syllabi. Counseling Services: Counseling Services provides confidential, professional services by staff psychologists, social workers, counselors and psychiatrists to help meet the personal and developmental needs of currently enrolled students. Services include individual brief therapy for personal and educational concerns, couples/relationship counseling, and group therapy on topics such as college adaptation, relationship concerns, sexual orientation, depression and anxiety. Counseling Services also screens for possible learning disabilities and has limited psychiatric services. Visit Counseling Services at http://utsa.edu/counsel/ or call (210) 458-4140 (Main Campus) or (210) 458-2930 (Downtown Campus). Students with Disabilities: The University of Texas at San Antonio in compliance with the Americans with Disabilities Act and Section 504 of the Rehabilitation Act provides “reasonable accommodations” to students with disabilities. Only those students who have officially registered with Student Disability Services and requested accommodations for this course will be eligible for disability accommodations. Instructors at UTSA must be provided an official notification of accommodation through Student Disability Services. 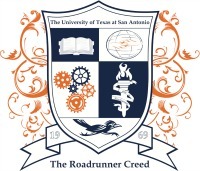 Information regarding diagnostic criteria and policies for obtaining disability-based academic accommodations can be found at www.utsa.edu/disability or by calling Student Disability Services at (210) 458-4157. Accommodations are not retroactive. Transitory/Minor Medical Issues: In situations where a student experiences a transitory/minor medical condition (e.g. broken limb, acute illness, minor surgery) that impacts their ability to attend classes, access classes or perform tasks within the classroom over a limited period of time, the student should refer to the class attendance policy in their syllabus. Supplemental Instruction: Supplemental Instruction offers student-led study groups using collaborative learning for historically difficult classes. Supported courses and schedules can be found on the TRC website. You can call the SI office if you have questions or for more information at (210) 458-7251. Tutoring Services: Tomás Rivera Center (TRC) may assist in building study skills and tutoring in course content. The TRC has several locations at the Main Campus and is also located at the Downtown Campus. For more information, visit the Tutoring Services web page or call (210) 458-4694 on the Main Campus and (210) 458-2838 on the Downtown Campus. Learning Assistance: The Tomas Rivera Center (TRC) Learning Assistance Program offers one-on-one study skills assistance through Academic Coaching. Students meet by appointment with a professional to develop more effective study strategies and techniques that can be used across courses. Group workshops are also offered each semester to help students defeat common academic challenges. Find out more information on the TRC Learning Assistance website or call (210) 458-4694.